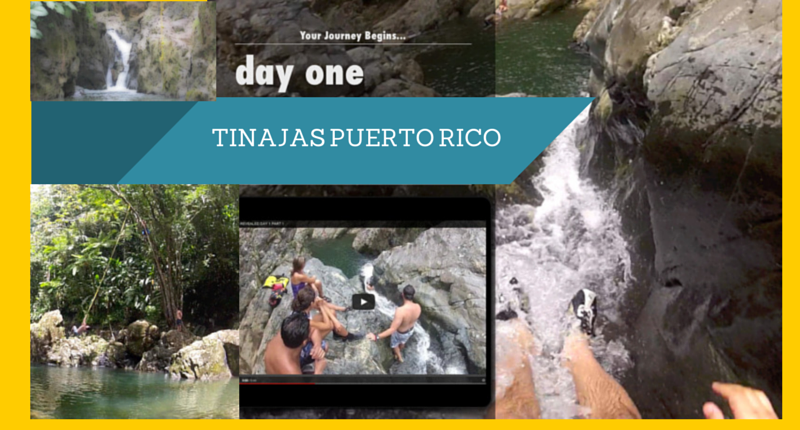 Rio Tinajas is more of a place that’s “off the beaten path” – located south of Fajardo – this is a fun time if you want to hike, explore, jump off ropes & waterfalls and slide down a natural water slide. 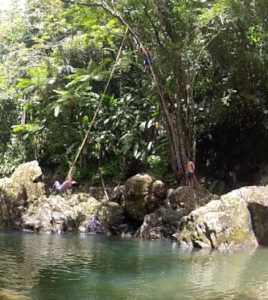 In terms of her enchanting nature, Puerto Rico…en realidad…lo hace mejor. Puerto Rico does it better. Tinajas Puerto Rico is a perfect example of this. 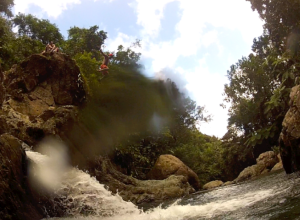 See, there are tons of places in Hawaii that have a place with a cool little waterfalls and a ropes where you can jump off of and get that “thrill!” However, hands down, Tinajas Puerto Rico tops that by far. This enchanting jewel is located in the backyard of this really nice older man’s backyard. Don’t worry. You’re not trespassing. In fact he’s quite cheerful and allows you to park in his home. He usually charges about $2 to park, but the times we’ve gone we give him about $7-$10 to park. I’m sure it’s some sort of good karma to pay him extra since he’s asking for so little in return for sharing this marvelous place. So give him more. Best money you will spend in Puerto Rico. Drive all the way till you see the gate and ask for him so you can park. Now bear in mind the gate may be locked and there may be no one in sight. I once went with my family when they came to visit me and I took them here. The gate was locked and for a second there I thought I had just driven all the way here for nothing. Sure enough, there are local kids who live next door who if you ask they can guide you or show you the falls. That’s what we did even though the gate was locked. If the gate is locked head down into the 1 foot river and head west along the river rocks and water. 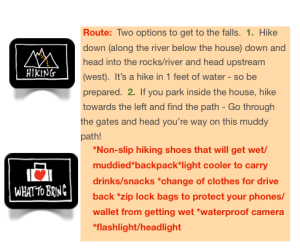 It’s a longer and more arduous hike – but not that difficult. One note about parking if you don’t get in the gate. Park along the grass but make sure you don’t park along the road where there are No Parking signs or you may get a ticket of $75. This is a great place. Positive vibrations estan aqui. Good times are had here. This hike, drive, and adventure is worth it while exploring Puerto Rico. The hike is only about 10 minutes – not too much of a load to bring a cooler. Also, just make sure to clean whatever garbage you make and clean after yourself. Unfortunately, I do love Puerto Rico, but you may see some littered beer cans and other garbage here and there. Remember to leave only your footprints. Once there, set your bags down and explore the place. If the water looks cold, go in anyways. If you don’t feel like jumping in, jump in. You will feel better. Have fun here, yet remember to be safe. Use your common sense and do what you feel comfortable doing. It’s not about getting hurt. It’s about having fun, enjoying life, and finding the hidden gems in our lives. This is one of them. If you’re lucky enough to have it to yourselves – wow. However, even if there’s too many people here – it’s still one of my favorite spots on the island. It’s a fun and “stupendous” way (as my niece Gaby would say) to spend a few hours in a natural playground. After you jump from the rope, it’s time to put on your hiking shoes and climb some rocks to get to do the other fun stuff. Hike past the ropes on the right side all the way up and past the rope that leads to the natural waterslide (and platform to jump the waterfall). There may be a rope there to assist you up the rock, if not go past it and hike upwards and climb the rocks till you’re on top of the falls. Ask the locals if not. If you’re by yourself use caution and common sense and follow the water – and enjoy the slide! Don’t worry it doesn’t hurt. In fact it’s a blast! 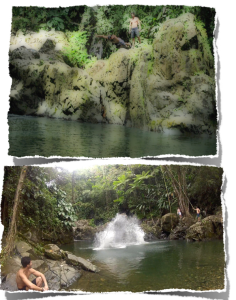 Last but not least is to jump off the waterfall if you’re up for it. It’s high up there, but quite an adrenaline rush once you jump. We can’t state this enough, but don’t do anything you don’t feel like doing. If you’re more of a spectator – it’s still entertaining to just sit in the pool and watch everyone jumping. Be aware of the rains – flash flooding can happen after heavy rains and river levels can rise instantly so be on the lookout always! The whole Rio Tinajas adventure should take you between 2-3 hours – depending on how long you want to stay. Head back to the car and try to hit the road once again by 1-2:30PM at the latest so you can rest assured you have plenty of time to check out the other stops on this Day 1 Adventure. From Route #3 take the exit for PR-195 into Fajardo. Make a right before you see the Subway Restaurant and get onto PR-976 heading South. Follow this road all the way down till it turns into PR-971. Drive on PR-971 till you cross a small bridge over the river – turn right onto an unnamed road. Follow that road all the way till you get to the gate of the owner of the house. The closer to the gate you park, the less time your hike to Rio Tinajas is.